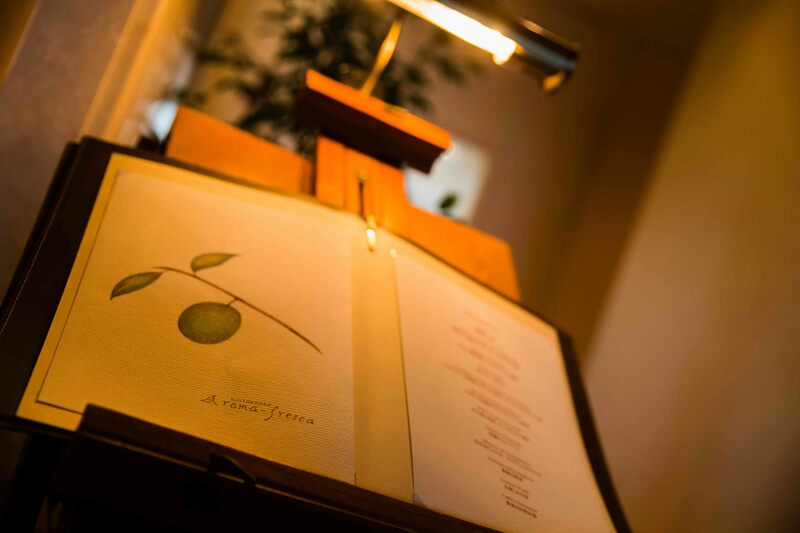 Beautiful refined Italian cuisine, impeccable service, and maybe just a hint of wine – the Aròma-frèsca dining experience is an intoxicating one. Aromas of the soothing, cooling kind greet you in each course, with colors reminiscent of an artist’s palette. With a delightful meal sitting gently in your tummy, you leave with a spring in your step and a happy heart, lifted by the whole Aroma-fresca experience. On the top floor of a Ginza building, you step out into a bright, glassy space with views over the city. Glass bubbles are suspended from the high ceiling, and thousands of mesmerising tiny bubbles travel upwards in glass tanks at the entrance to the dining room. There is a lovely energy of freshness and vigor. The hardwood marquetry floor is adorned with a Persian rug, the tassels of which are lovingly combed each day. A magnificent seasonal arrangement graces the center of the dining room and affords each table privacy in this grand space with just twenty seats. It is gorgeous yet warm and welcoming; meticulous care goes into keeping this formal dining room elegant and comfortable for its guests. The delicate pattern of flower petals on the porcelain ware gives a sense of Japan with the feel of Europe. 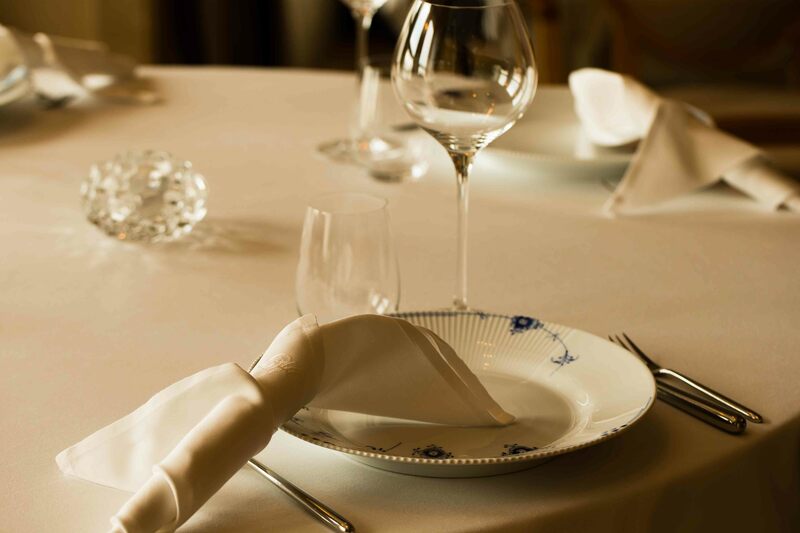 The unique folding style of the napkin conveys a message that this is a formal dining experience, but that there is plenty of room for pleasure and relaxation. As you fold into the generous chairs with café latte striped fabric, you may be struck by the lower than typical height of the chairs and tables. This is all to bring you closer to the aromas to be showcased in the meal to follow. 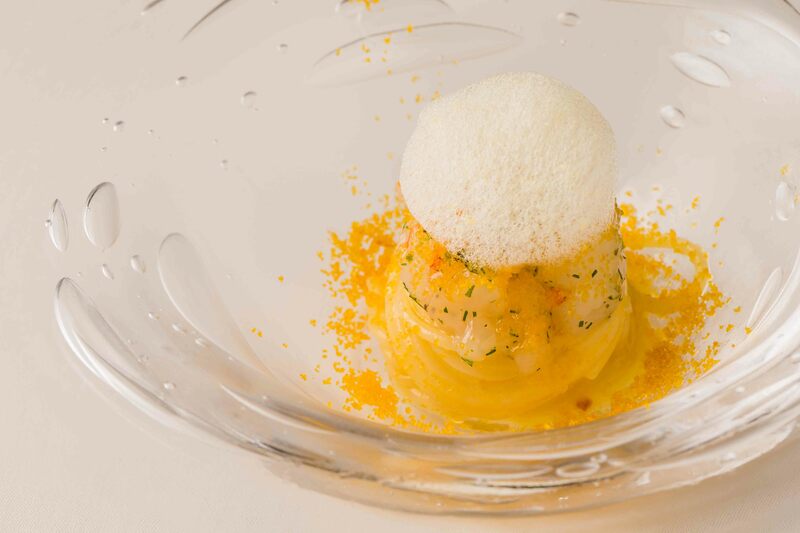 True to its name, fresh, cooling aromas grace every dish at Aròma-frèsca in an elaborate course that pleases the palate with an array of delicate flavors and exquisite presentation. The signature dish is a crudo of Akaza ebi lobster from Takeoka, Chiba, cooked ever so slightly on the shell side leaving the flesh light pink, plump and delicious. 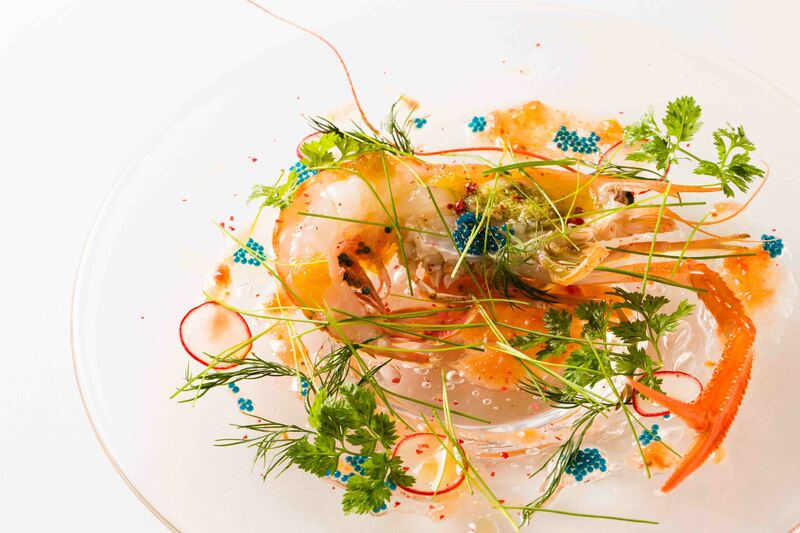 The clear glass plate heightens the cooling experience and highlights the brilliant colors of the dish – the deep orange lobster shell, green herbs of coriander and dill, and an aromatic fresh tomato sauce, all topped with the sapphire-like luster of the lobster’s bright blue roe. 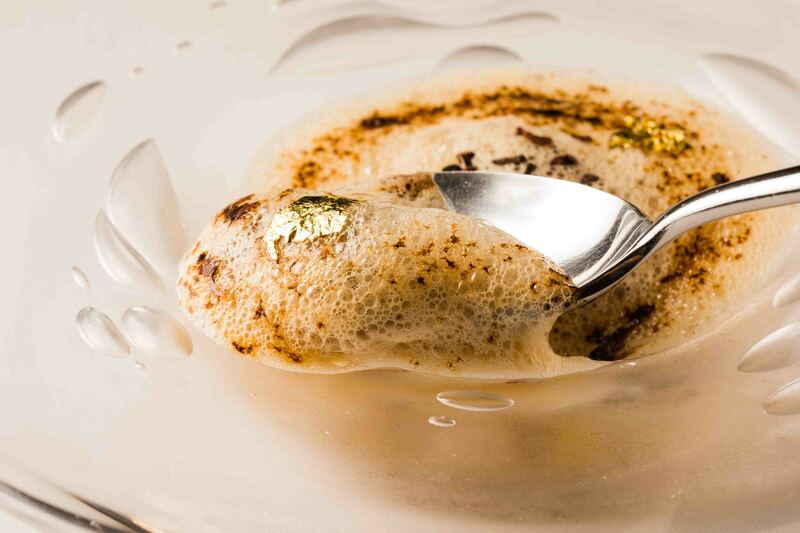 Abalone cooked over charcoals is served in its lustrous shell with sautéed Porcini mushrooms, a swirling bubbling ocean foam, and guanciale cured pork cheeks. 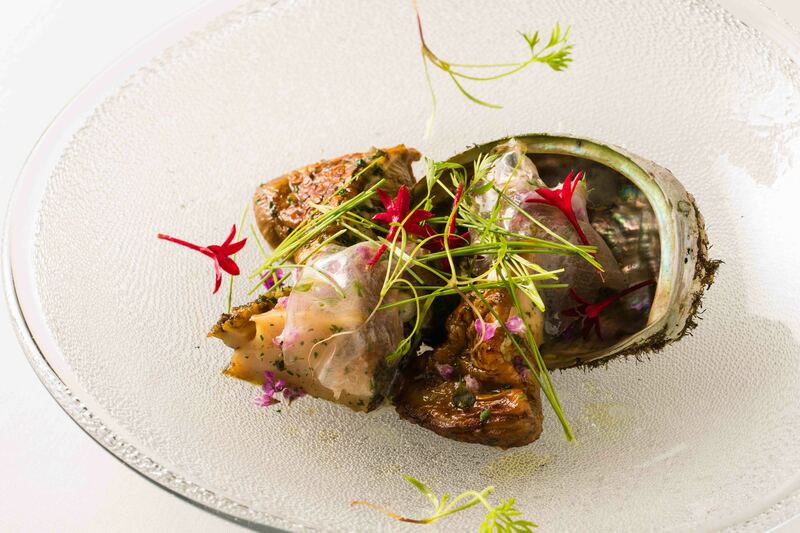 This dish has heady, rich, earthy aromas that draw you into the succulent velvety textures and deep flavors. Next, a cold capellini pasta with plump botan ebi shrimp and bottarga. Topped with a sudachi Japanese lime foam, the light passing through the glass dish reflects on the crisp cloth below like ripples on the water. This is followed by a warm tajarin (Piemonte dialect for tagliolini) in egg yolk sauce with parmesan and a mountain of marbled shavings of Umbria truffle. 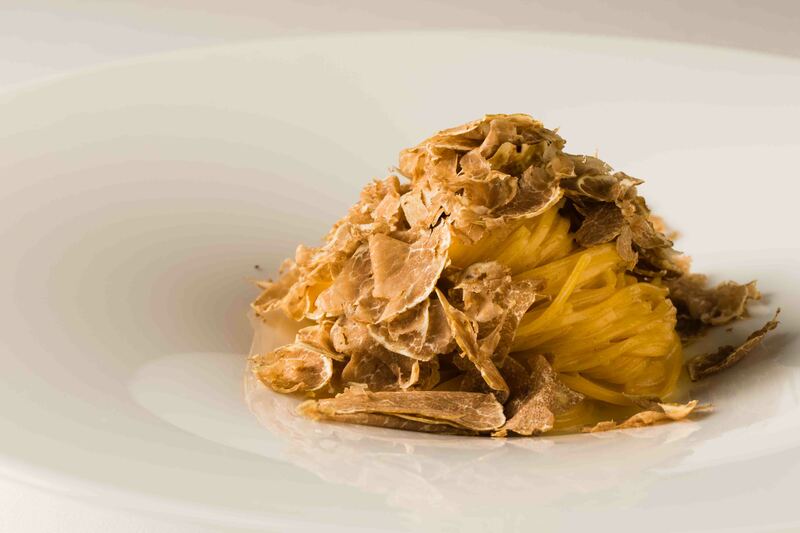 As you devour the last bite, you will likely be planning your next visit, as you hear that premium Alba white truffles will be next to come into season. Bistecca is the signature main dish. 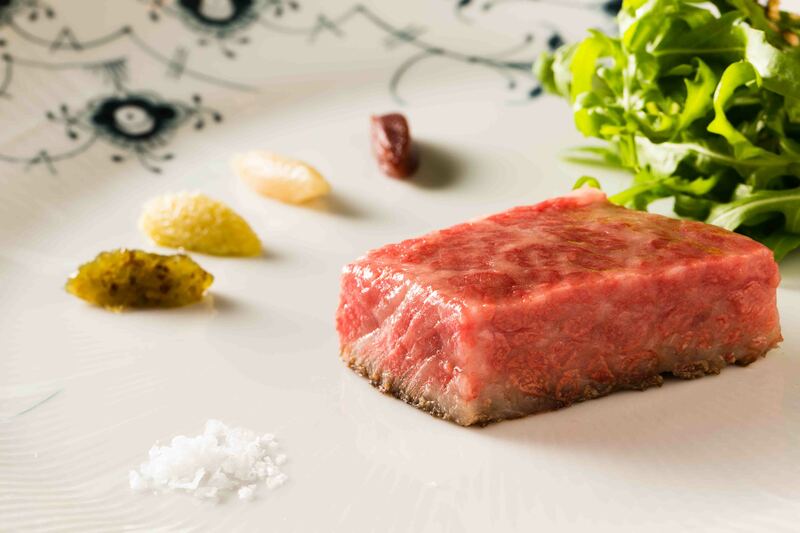 Purposely placed with the non-grilled side face up to showcase the glossy marbling of the beef from young female cattle from around Japan, it is a surprise to learn that simple knifework enables this presentation and that the meat has been fully heated through to medium rare. The customer is invited to find their favorite flavor combination from among four quenelles of condiments: a refined horseradish, garlic paste, red wine reduction paste, and mostarda sweet-pickle fruit combined with grainy mustard. The chef also loves to create desserts that cool guests down after a stimulating dinner. 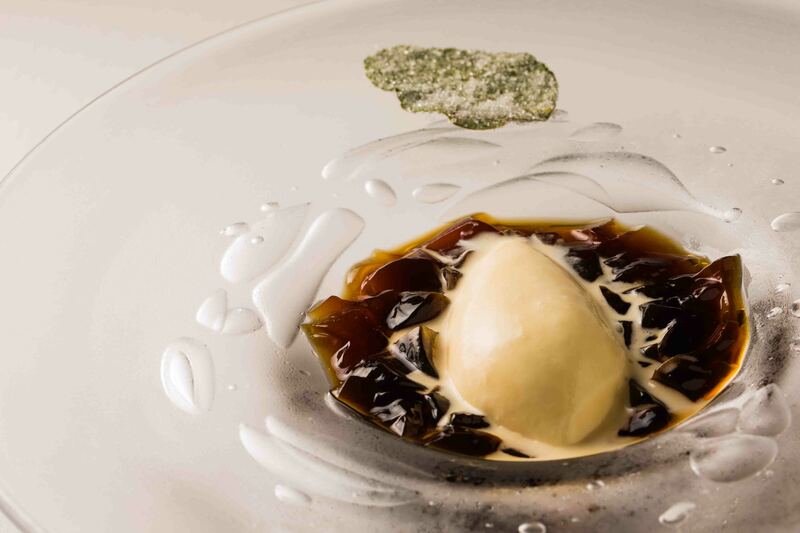 A particular favorite is crushed espresso jelly with a dash of kuromitsu Japanese brown sugar syrup served with kaffir lime gelato. Served on a chic white plate with a sugar-coated kaffir lime leaf, the flavors are so beguiling that you cannot stop until every last taste is gone. Chef Harada focuses on using what he has immediately before him, bringing in produce and proteins that speak of the seasons from all around Japan. Aroma-fresca staff are at Tsukiji every morning to greet suppliers and pick up the latest orders. Abalone and prawns from Chiba, beef from Hokkaido, and truffles from Italy. Many of the colorful touches on each dish are micro leaves and wild grasses from a farmer in Osaka. Harada also incorporates ingredients like foie gras and wild boar from Canada, not ruling out options as long as they fulfil his high standards for quality and flavor. In addition to flavor, ingredients have appealing aspects such as color and aroma. When creating menus and deciding how to spotlight seasonal ingredients, Harada chooses just one of those aspects and searches for the method to emphasize that quality in the specific dish. The slightest differences in cutting methods or heating styles can have an enormous impact on an ingredient, allowing a single item to show many different faces. Shinji Harada is a happy and talkative man, generous of spirit and with his time. At 17, he joined a local ramen shop in his home prefecture of Tochigi. Surprised to be put in charge of many tasks from a very early stage, he thrived on the excitement of feeding and pleasing many customers, which fueled his passion for cooking. 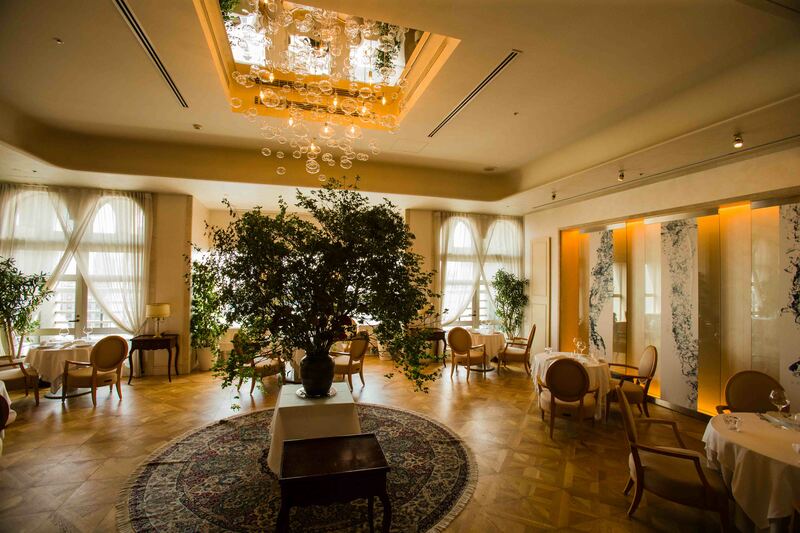 He enrolled at Gino's in Roppongi and was fascinated by the dynamism of Italian cuisine. Working under renowned chef Hiroshi Satake for five years total, at just 21 years old Harada was put in charge of cooking. And he became the head chef at age 24. Of course grateful to have been thrown the challenge and given the opportunity to grow, Harada recalls it as a very stressful time. On days off, he was so exhausted that even though his eyes opened, he couldn’t convince his body to move. He headed the kitchen at a different Gino group restaurant for an additional four years before taking the plunge to go independent with Aroma-fresca. While the restaurant has moved several times since opening in 1998, Aroma-fresca has constantly served Italian cuisine with Japanese influences to rave reviews. In the glitzy Ginza neighborhood, it continues to wow all who are lucky enough to get a reservation. Harada has been to Italy so many times he has lost count, but never for more than a month at a time. He has such a great capacity for soaking up the flavors, aromas and atmosphere of authentic Italian. But his greatest talent is interpreting all those elements to create his own style, putting lightness of touch, splashes of color, and stimulating aromas into every dish. Chef Harada’s enduring objective is to work towards ever better creations. However, his broad perspective also means his sights are set far beyond his own Ginza kitchen. Talk turns to a possible upcoming project for a collaborative restaurant in Asia. The new challenge clearly elicits excitement in the eyes of Chef Harada. From a truly impressive wine list and cellar, guests are welcome to enjoy a wine pairing course, or select wines by the glass or bottle. It is almost impossible, when surrounded by so many bubbles, to start a meal at Aroma-fresca without sparkling wine. 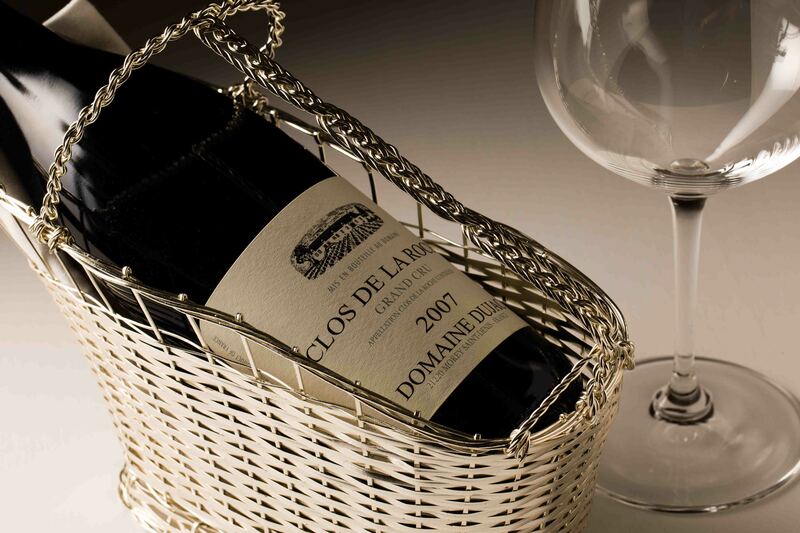 White wine can be enjoyed throughout the meal, as a rich and textured complex white wine would more than complement the signature steak course. But of course, red would be a fantastic choice too. All served in the perfect glass to accentuate aromas, some of the glasses stand on very tall stems bringing the aroma right to your nose. 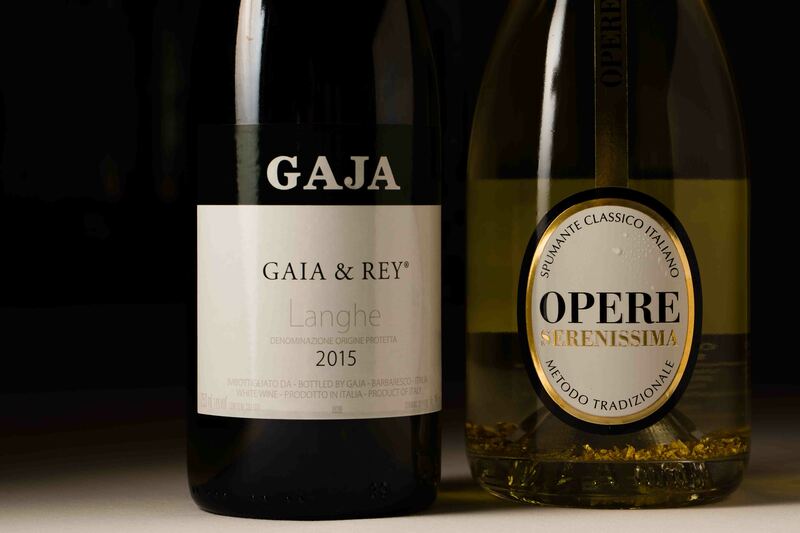 Mostly Italian, with a little French, the collection includes countless traditional Italian grapes and wine styles such as Piemonte Nebbiolo and Toscana Sangiovese.